Paradise Palms is a Mid Century Modern housing community. The home pictured is known as the Caddy Shack. I’ve been fortunate enough to represent buyers and sellers of this home five times over the years. I’ve been the number one Broker/Agent of Paradise Palms homes for over ten years and happy to say I’m maintaining that status so far again this year. In the 1960s Irwin Molasky’s company Molasky Development hired the young architectural firm of Palmer & Krisel fresh from their success building hundreds of successful tract homes for Alexander Homes and other custom projects in Palm Springs, California. “This unique subdivision was the first planned community in Clark County. We used curvilinear street patterns instead of rectilinear. Paradise Palms won the American Builder magazine award for one of the best planned communities in the U.S. The architects were two young men by the names of Palmer and Krisel. The interior designs were by world-renowned C. Tony Pereira.” Irwin A. Molasky. The tract is sprinkled with several Mid Century Modern home styles. The homes are standard post and beam construction on slab. Most sit on a 40-by-40-foot (12 by 12 m) imprint. There were numerous models available, but to make the homes look custom, the footprints were rotated on their lots and flipped with a minimum of 3 different roof lines available: folded plate roof lines, butterfly roofs, ranch, and dramatic overhangs. The homes also featured unique decorative block work and stone screens and were generally finished in sanded stucco. “Street side, facades stretched almost the full extent of the 100-foot (30 m) wide lots. Concrete block or extended stucco walls connecting house and carport were intended to add length to the front of the house for a more imposing appearance. Idiosyncratic decorative elements made use of wood, decorative concrete block, patterned brick, two-tone paint, rock, ironwork, spun fiberglass panels, and other materials.” Robert Imber, Eichler Network. Here are some of the celebrities, politicians and other notable early owners of homes in Paradise Palms. These were culled from a variety of sources. 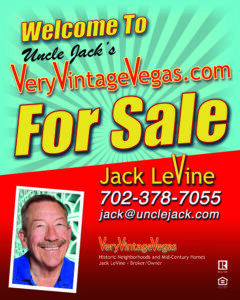 Jack LeVine has been trusted by well over a thousand clients in the last 28 years. He gets the job done – and gets it done right. No other agent in Las Vegas has the depth of knowledge and experience that Jack has of the vintage neighborhoods, the mindset of buyers for 50 or 60-year-old homes, and the special things that dramatically affect the value of a vintage home.